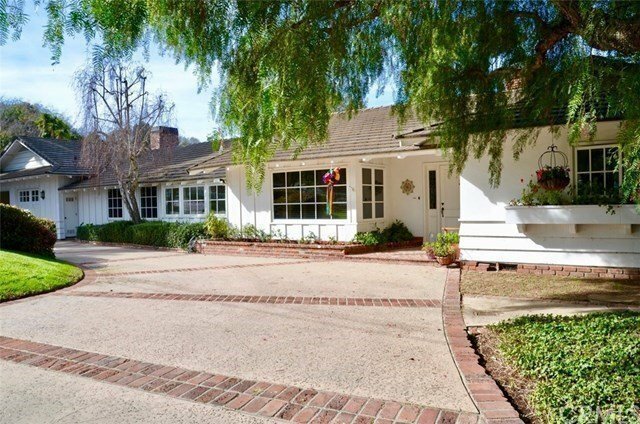 Welcome Home to this Classic Rolling Hills Home originally Built in 1957 and Remodeled in 1981 and then an Addition in 2005. Undoubtedly the Best Value on the Market currently and Located on One of the Most Central and Charming Roads in this Private Equestrian Community. With a View of the Queen's Necklace, Mountains and City Lights at Night From several areas of the Home, and Harbor View Lights at Night from the Kitchen, this is a True Equestrian Home. The Home offers Kitchen, Family/Great Room, Living Room with access to the View Patio, Formal Dining Room and Two Master Suites. The most recent renovation added a Master Suite with one of the Four Fireplaces in a Large Sitting Area, Walk In Closet and Double Vanity MasterBath. There are two other bedrooms, one was the original Master and Features a Fireplace, Spa Tub Double Sink Vanity and Second Walk In Closet. There is a Beautiful Wood Paneled Office and Hardwoods in Many Rooms, with Hardwoods under carpet in Living Room and Hallways. There is a 760sgft Fully Permitted Basement with Full Utilities, Heating and AC and Plumbing Ready to tie into Newer Septic System installed in 2005. Create a fabulous Guest Quarter or Man Cave. Established driveways down to the Lower Riding Ring Pad and the Two Barns are at MidLevel. Circular Driveway and Oversize Two Car Garages. Really a fully utilized Property! Available to Show with Notice. 50 Miless of Maintained trails, Three Tennis Courts and Two Riding Facilities. WOW!